Home > Crisis Control > Is Your Child Eating Properly? It is easy for a stay-at-home dad to fly into a panic if his child is not eating properly, but that reaction will only add to the problem. The best way to deal with a fussy eater is to offer a wide variety of healthy foods in a relaxed, positive environment so that mealtimes can be enjoyed by everyone involved. Househusbands who hover over a picky eater at mealtimes, coaxing, cajoling and counting calories, will succeed only in making the child even more unwilling to eat. Instead, try not to make a big fuss. After all, it is not particularly unusual for toddlers to become choosy where food is concerned. Foods they appeared to love a few days ago can be cast aside and the child will decide, all of a sudden, to eat only a select few foods over and over again and refuse the rest. The simple truth is that children like things to be familiar, be it their bedtime routine or their jam sandwich, so many will not try new foods until they have been exposed to them several times. Be patient and introduce only small quantities of one or two new foods at a time. Place the new food on the table along with everything else and do not single it out. If dad is seen eating the food a few times, the child may feel more open to trying it. If so, put just a taste rather than a whole serving on the child's plate. This way the child will not feel overwhelmed and it won't waste food either. Remember that some children have more sensitive palates than others and so may not like the taste, texture or even colour of some foods. This is why some children can claim to dislike a food before even trying it. Children can also associate a certain food with a time when they choked or were sick and so may have an aversion to that food. Stop offering any such food until the child is a little older. Try to involve the child in food decisions whenever possible, whether it is shopping or making dinner. Children are more likely to eat something they have chosen for themselves, but try to limit the options to healthy ones, thereby maintaining an element of control over the child's diet. 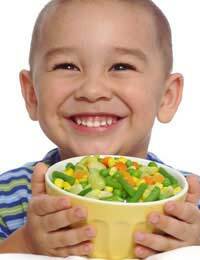 Children can use fussy eating as a way to exert their independence and test the limits of a parent's authority. That is why putting pressure on a child to eat can backfire. A lot of parents consider their children to be fussy eaters, yet the vast majority of these children consume a wide enough range of foods to meet their nutritional needs. It may seem as though a child with a short attention span will not sit still long enough to eat very much at all, but children known how much food their bodies need to grow and be healthy and tend to be good at getting what they need. Children can be more open to trying new foods once they attend a playgroup or nursery and see friends eating different kinds of food, but if all the options have been exhausted and a dad is still worried about his child's eating habits, he should raise those concerns with a health visitor or GP.